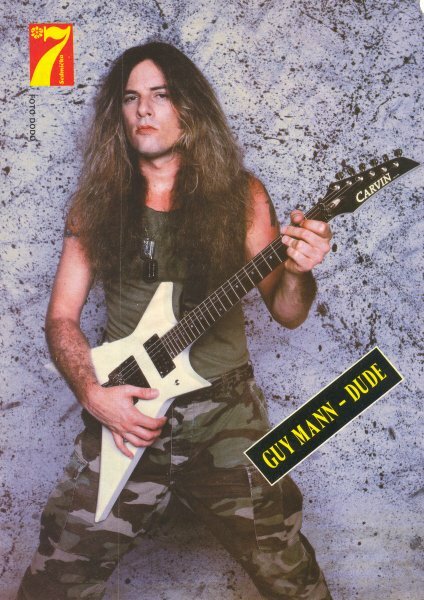 Guy Mann-Dude is a respected, American-born musician who was best known in the late 1980s and early 1990s after his self-named band formed in Los Angeles, California in 1988. He was the guitar player for the Michael Angelo Band before going solo and also was part of the heavy metal supergroup, The Dudes Of Wrath. Along with Paul Stanley of Kiss and Tommy Lee of Motley Crue, Guy was specially recruited to record a song called Shocker for the movie of the same name. I saw Patto twice and have always have been one of Ollie's biggest fans. You can hear the influence on my second album, Mannic Distortion . You'd get a kick out of the couple or more Ollie runs. When I was 'shredding' in the 80s and 90s, the kids thought, 'Oh he was maybe listening to Yngvie, Eddie etc. Well, they had no idea! I had a column in Guitar School Magazine,'Out To Lunch With Guy Mann-Dude'. It was an Artist to Artist column and I interviewed a lot of heavy names: Mclaughlin, Demiola, James Hetfield etc. I got the OK from Guitar World magazine to interview Ollie. So we started tracking him down. I knew Clem Clemson and called him in England. He told me that Ollie was in Spain. Well, a few days later the news broke about his death. Weird huh?